- Vehicle Mounted: The LiveU Xtender dramatically improves cellular reception, bandwidth, resiliency and latency in every scenario. 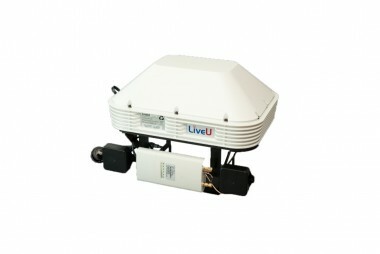 Based on LiveU’s fourth-generation bonded uplink technology, the integrated solution offers broadcasters the flexibility to use cellular connectivity as part of their existing SNG and ENG trucks, bonding cellular and satellite connections for the ultimate live video performance. Combining LiveU’s LU700 encoder with LiveU’s powerful Xtender antenna, the solution adds six 3G/4G LTE network connections and is optimized for all emerging 4G LTE implementations worldwide. - Tripod Mounted: The tripod-mounted Xtender antenna can also be connected to LiveU’s other backpack and handheld units, offering even greater resiliency, performance and flexibility in crowded demonstrations, sports stadiums and other extreme scenarios. With extended wireless connectivity (with optional wireless kit), the Xtender can be situated up to 1,000 feet/300 meters away from the uplink unit, offering far more than a regular cellular antenna.